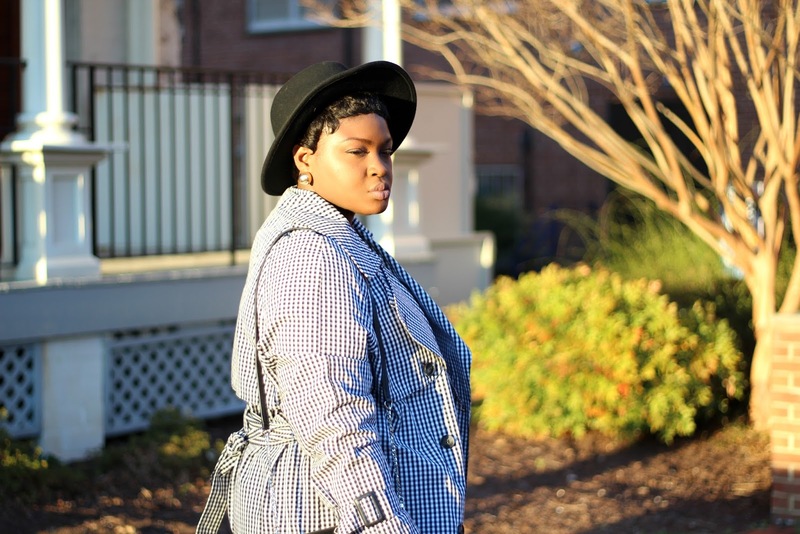 As soon as I saw this Gingham Trench I thought Jackpot! 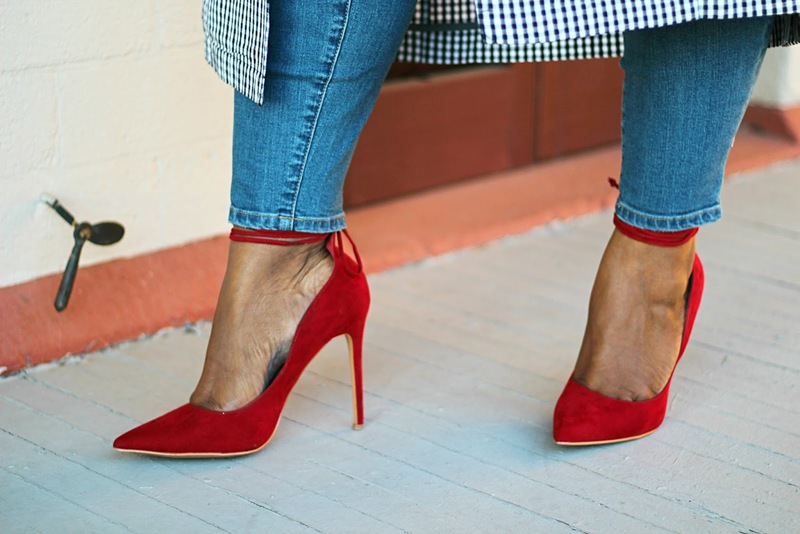 In today’s post I’ll be sharing how to wear one of my favorite spring trends Gingham (see Spring Trends Guide). 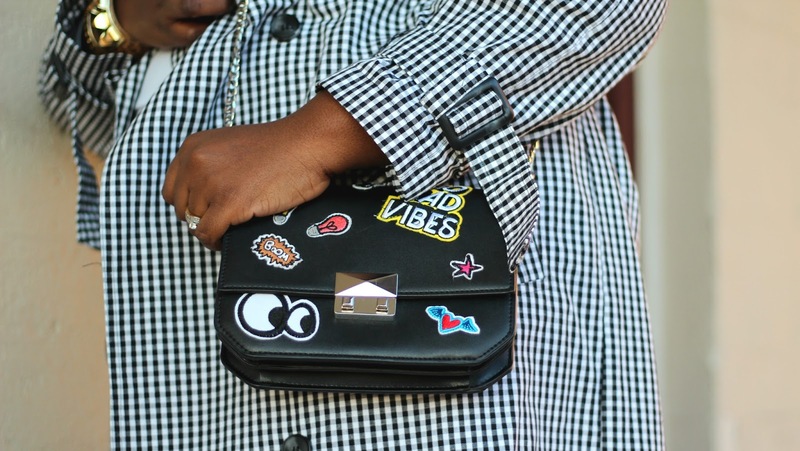 Before we discuss styling, let me make a case for Gingham its a classic print (timeless), and in small doses it can add a pop of print/interest to an outfit. Because the print is a mix between feminine and androgynous it can lend itself to both casual and formal attire. I mentioned in my spring trends guide you can wear your Gingham in various ways. If the print scares you, start small with accessories like a bag, Shoes (try a loafer) or a scarf. If you are comfortable with the print try a Top or Pants or a blazer. Love the print try a Coat like mine, a Dress or even a mixture of colors you name it. If you go however with the classic gingham print, you have two options. You can treat it like a neutral, and make it the focal point of the look by pairing it with other solid colored neutrals. Or you can play with its print by pairing it with other larger prints. For this look I went with a goto, Jeans and a Tee . 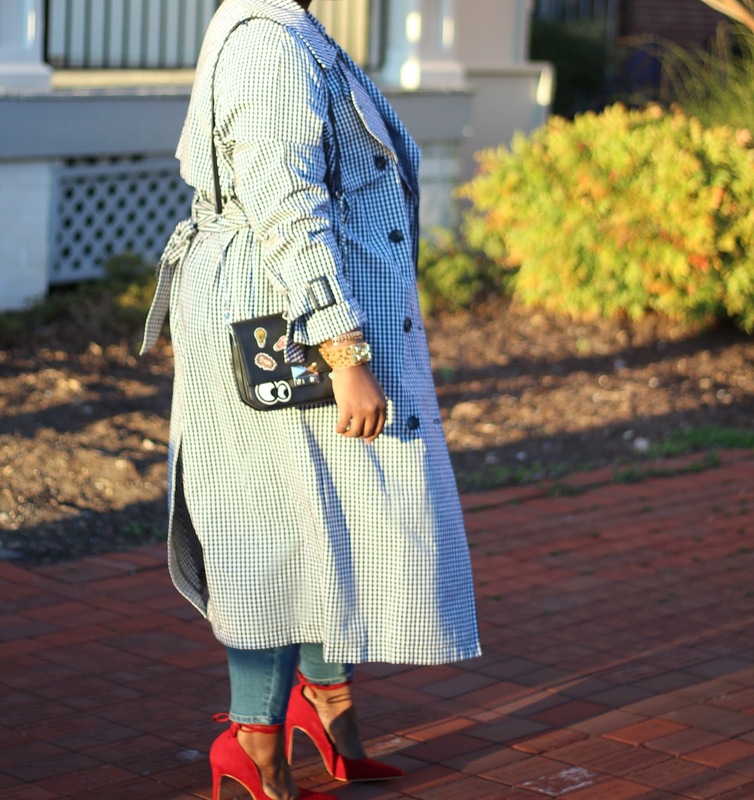 I upgraded the tee by pairing it with Red pumps (hot trend alert) which is currently on sale and off course my Gingham trench. 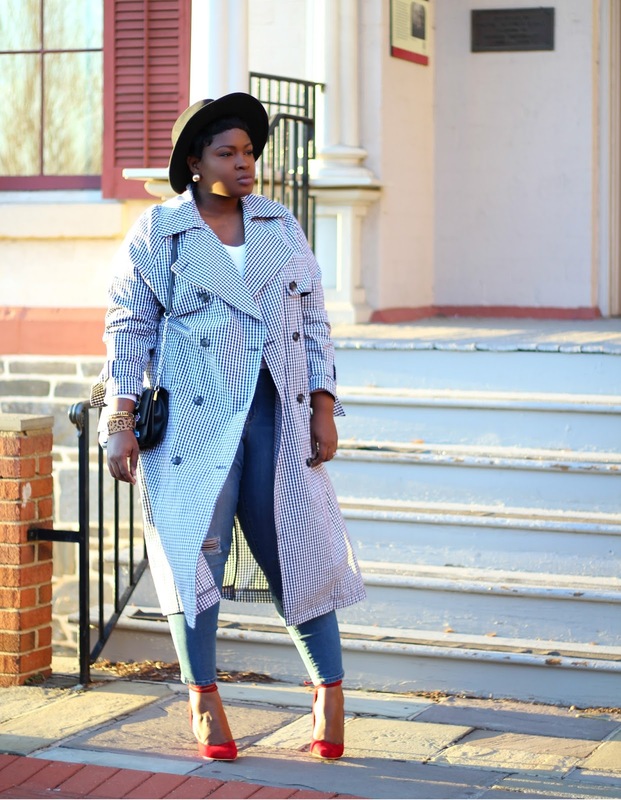 I scooped up the Trench while I was in London from Next (get it Here) and I am wearing a UK18 which is a US 14 (more Info Here). As far as the rest of the look my Jeans and Tee came from Fashion To Figure (they make great jeans BTW) and my Hat came from Nordstrom. Those of you who follow me on IG/Snapchat or were at the Plus + event know I wore the look to speak on a panel at Howard University on women’s day. I hope to be a part of more events this year. I seem to have gotten the bug and want to collab on more events. Are you loving all this talk about spring fashion, if you are you will want to get first dibs on the list (Key will sell out pieces) to shop for spring/summer 2017? Sign up for our Newsletter for exclusive content and upcoming happenings also follow this blog on Bloglovin. What are your thoughts on the Gingham trend? Love it, hate it, how did I do? 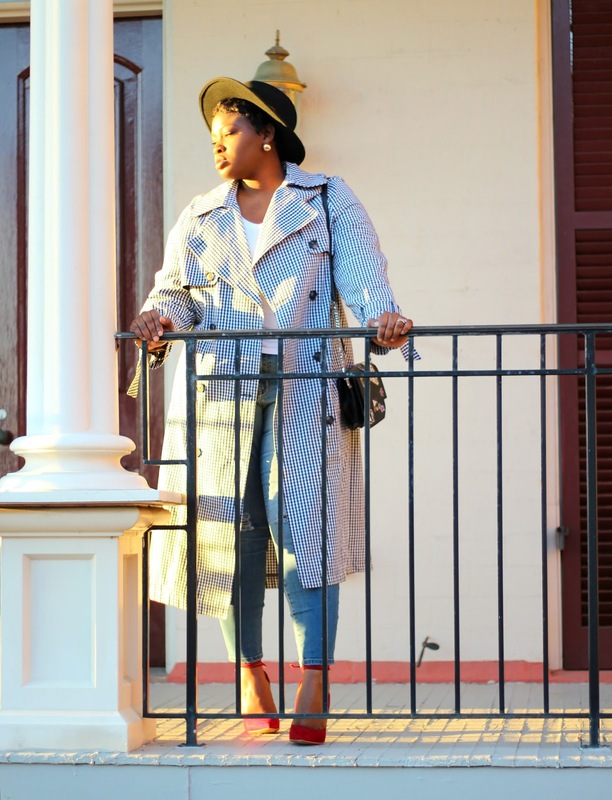 I love that Trench on you and Yes. . gingham has been around for ages and not going anywhere.